Once one of the strongest national title contenders in the country, Iowa’s stunning collapse continued Thursday with a loss to lowly Illinois in the second round of the Big Ten tournament. Where do the Hawkeyes go from here? INDIANAPOLIS — Iowa says it will be fine. Iowa believes it will be ready to win in the NCAA tournament. It issued these assurances in an oppressively glum Bankers Life Fieldhouse locker room, a space rife with frustration following a 68–66 Big Ten tournament loss to bedraggled Illinois. It was the Hawkeyes’ sixth defeat in eight games. It was their third straight Thursday exit from this event. After the game, the droning shower room fan demonstrated more vitality than any of the sullen players with equipment bags at their feet. The Hawkeyes say they will be fine, but the circumstances pretty much undermine the chance that anyone will believe them. What in the name of campus architect D. Elwood Cook happened to the team that rose as high as No. 4 in the national polls in early February? What happened to the coherent, potent club that looked like the 2016 version of 2015 Wisconsin after winning 10 of its first 11 conference games? These are the questions that will trail Iowa into next week, when it attempts to navigate the NCAA bracket while confronting the sabotage of what seemed a perfect season. The Hawkeyes were a team stacked with experience—they start four seniors and a junior—in a college basketball season that favored the wizened. They were a potential No. 1 seed staring at a cozy postseason path through Des Moines and maybe Chicago. Everything lined up right, and then everything wrecked. The screaming disappointment in that might explain the silence and defiance and denial on Thursday afternoon. It’s not just that the season broke bad. The ideal setup to chase a title fell apart. And expunging that dark matter from their minds might be the biggest challenge for the Hawkeyes before they play again. As for his group’s confidence? “It’s obviously not where it was a month ago,” McCaffrey said. Foreign Trade: Is there a link between booking tours and landing recruits? No, a month ago, the Hawkeyes were 19–4 and 10–1 in the Big Ten and they weren’t having many of the problems that bubbled up once more on Thursday. Asked to describe the common threads in the slide, McCaffery was blunt as a bat to the skull. “It’s pretty obvious,” he said. “We’re not making shots and we’re turning the ball over.” His team provided a case study on that against Illinois, firing at a middling 40.3% for the day and committing 18 turnovers. The miscues aren’t actually as much of an epidemic as Iowa’s coach might have you believe; the Hawkeyes have averaged a manageable 11.8 turnovers per game in this stretch of misery. But the lack of consistent shooting is stark. In these last eight games, Iowa has fired at a 45% clip or better just twice. Playing free and playing fast always will be the lifeblood of a McCaffery team, and aggravation builds fast when the offense sputters. Less quantifiably, there’s just something off about Iowa. A team that was so sturdy and assured through early February is wobbly all over. With 4:02 left in the game Thursday, junior guard Peter Jok tangled with Illinois’s Kendrick Nunn under the rim as a shot went up. At the time, Jok had 29 points. He also had four fouls. 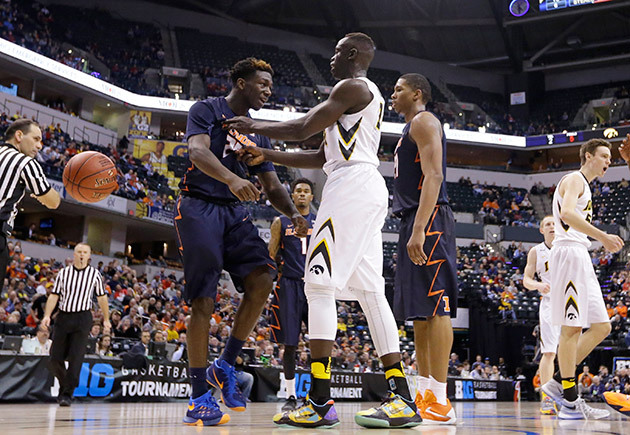 And after Nunn’s arm appeared to push against Jok’s neck as the two locked up, Jok separated himself from the Illini sophomore with a two-handed shove in full view of officials. The double technical fouls on the players disqualified Jok for the rest of the day. A junior with 50 career starts, and one of the few reliable offensive threats on the day for the Hawkeyes, got himself bounced for no real discernible reason other than the inability to maintain his own composure. Jok was left to monitor ensuing timeouts from behind the huddle, gnawing at his fingernails. It was a baffling lapse, but it wasn’t the last. While the Hawkeyes are due credit for the late 11–0 burst that tied the game with 93 seconds left, the flailing after that was staggering. After Malcom Hill hit a go-ahead jumper with 1:14 left, Gesell bricked a shot from the free throw line. With another chance to tie or take a lead after an Illinois miss, Gesell lost control of the ball, resulting in a jump ball with 4.8 seconds left. The Hawkeyes retained possession, and the ensuing inbounds pass was tipped and bounced out of bounds, off Iowa, with 2.6 seconds left. When the Illini subsequently inbounded, Iowa couldn’t even catch them for a foul. It made for a weak, disjointed anticlimax, and it was hard to believe this was the same team that was slaying the Big Ten for more than a month. Thus began a fusillade of short, cranky retorts from a team wondering, like everyone else, what is going on here. What was the call before Gesell missed that jumper? “It’s none of your business what the play call was, period,” McCaffrey snapped. What’s on the checklist of things to tune up before the NCAA tournament? Why are the Hawkeyes confident they’ll be ready for what’s next? The Hawkeyes can be forgiven their frustration and irritation, for sure. But when a team only spews platitudes that there’s really nothing to see here, despite buckets of evidence to the contrary, you suspect that team is short on answers. You suspect that team doesn’t in fact understand why it all came apart. You suspect that team is just as stunned at what has happened to a once-mighty national title contender as everybody else in the country. Iowa says it will be fine. That might be right. But you suspect the opposite is as likely to be true.